Kovalam Ayurveda Tour offers a much desired and required break from this multifaceted life and rejuvenates the travellers in this beautifully blossomed beach setting. Outcropped by rocky promontories, Kovalam is Kerala’s most developed beach resort and is known for numerous Ayurveda resorts. This special interest tour to Kovalam is a treat for the senses where tourists’ can experience the spread of oils, medicated powders and massages on bodies (subject to prescription) near the alluring scenic spread of balmy beaches. It is an amazing experience to feel healed under the aegis of Kovalam’s freshness and Ayurveda, a desirable blend of life. All this and much more can be a part of Kovalam Ayurveda Tour. Upon arrival in Thiruvananthapuram, meet Incredible India Tour representative for assisted transfers to the beach resort in Kovalam (16 km from the city center). With its picturesque tropical beach setting, Kovalam lures the tourists with its hearty amalgam of sandy beaches, gushing sea tides, fringed coconut palm cover, delightful tourists and an elixir of life in Ayurveda. 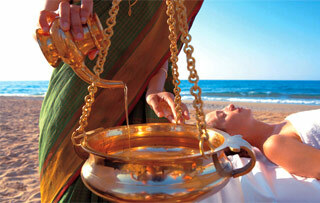 At least a week is required to attune a body to natural fervour in the company of traditional Ayurveda treatments. In the noon, meet the Ayurvedic physicians and doctors who will identify the body imbalance and prescribe the set of massages, diet correction and other special treatments based on the ailment. Ayurveda helps in preventing the disease or ailment rather than curing it, so it helps in reviving the soul. The rest of the day is free for tourists to settle in the Ayurvedic Resort and experience the bliss of Ayurveda on the Beaches of Kovalam. 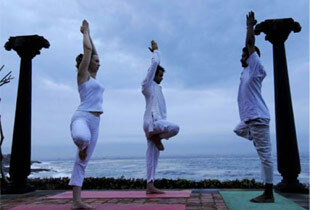 Wake up early morning as per the schedule of Ayurveda resort for Yoga and Meditation session. This will calm the stress from head to toe and ease out the body and soul from within. Different Yoga postures display the art of balancing body through control of mind. Meditation unites the brain and body and continuous practice will activate life's hidden energies. This relaxing session will be further enhanced with a rejuvenating ayurvedic massage as per the prescription of physicians. The massage given here will be having a therapeutic effect on the body, mind and soul. Rest of the day will be at the luxury of the tourist. He / she can spend hours on the beach or relax in the alluring setting of the Kovalam's ayurveda resort where tourists will be staying. Overnight in resort. This morning also, treat the body, mind and soul with an alluring blend of Yoga, Meditation and Ayurveda Massage. Under the guidance of Yoga experts, learn new asanas in the morning session. If these asanas or postures are achieved, it will be an essential element for a healthy life ahead. Post lunch; proceed for a half day sightseeing tour of the Thiruvananthapuram city. This capital of God’s own country, Thiruvananthapuram is the gateway to the southern tip of India. Visit the world’s wealthiest temple - Sri Padmanabha Swami Temple, Napier Museum, Shanghumugham Beach, Tropical Botanical Garden and Bay Watch area. After sightseeing; return to the comforts of the resort for overnight stay. Next morning, again attend the yoga and meditation session and notice the difference from the first day. The body will be more flexible during Yoga postures and the tourists will be able to concentrate better during the meditation session. Adhering to this special regimen for longer time will activate the hidden energies and contribute to the better living in the long run. Afternoon will be at leisure. In evening, a peaceful boat cruise on the exquisite backwaters of Thiruvallam is scheduled. Participating in this eco-friendly tour will help a tourist relax more in the salubrious surroundings of Kerala Backwaters. Return to the resort for overnight stay. After the refreshing morning of yoga, meditation and Ayurveda session, enjoy the noon at leisure and soaking in the rejuvenated state of existence under the aegis of these wellness sciences. Post lunch, head towards CVN Kalari Center. This is the traditional martial art of Kerala. Observe the fighters in their engrossing fight here. They are also given special Kalari massage through which they attain flexibility and dexterity. Return to the resort for overnight stay. Follow the daily session of yoga, meditation and ayurvedic treatment on Day 6 in morning. After lunch, drive to Kanyakumari, famous for beach based on the confluence of three seas, Arabian Sea, Indian Ocean and Bay of Bengal. This is also the geographical end of Indian mainland bedecked with tourist attractions of Vivekananda Rock Memorial, Gandhi Memorial on an offshore island. Experience the dusk here, presenting the most surreal sunset at the Kanyakumari Beach. Return to the resort for overnight stay. After completing the morning session of Yoga, Meditation and Ayurveda, get ready to spend the time of leisure at the languid beaches of Kovalam. Kovalam stands for a grove of coconut trees and here, one can find plenty of blooming coconut palms. Azure water stretching over wide horizons is perfect for swimming. (in rainy seasons, it is prohibited.) Also, they present the beautifully enchanting views to the tourists, making it a hotspot destination. Light House Beach and Hawah Beach offer an inviting ambience for most tourists, whereas Samudra is a private beach resort owned by Kerala Tourism Development Corporation. After the tryst with the beaches for unlimited time; return to the resort for overnight stay. Wake up to another refreshing morning with the last Yoga, Meditation and Ayurveda Session at the Ayurveda resort. This day can be taken as a counseling session, where the tourists can ask the guests about the yoga tips, lifestyle changes, diet correction and exercise for a proper revitalized existence. Rest of the day will be at leisure alongside the beach. Overnight at the resort. After a relaxed morning, receive a timely transfer to Trivandrum by our representative and take back the secret of rejuvenated existence with the invigorating Kovalam Ayurveda Tour.